Bio Notes: John Deacon Richards was born on 7 May 1931, the son of William John Richards, export manager, and his wife Ethel Waggott. He studied for the diploma in architecture at the Architectural Association in London. He was admitted ARIBA in 1955 and ARIAS in 1958. From the AA, he went with David Whitham and John Bell to seek employment within the National Coal Board of Scotland, the Board's head architect Egon Riss being a friend of one their tutor Arthur Korn. All three were appointed, with Richards assigned to the Welfare Division (formerly the Miners Welfare Committee) where he worked on pithead baths, canteens and other social structures. He joined the practice of Robert Matthew Johnson-Marshall (RMJM) in the early 1960s, becoming a partner in 1964. 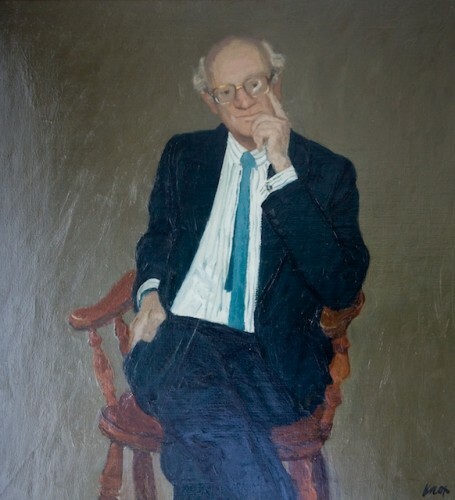 He was Chairman of the Edinburgh partnership from 1977 to 1986 and latterly the whole partnership from 1983 to 1986. At RMJM, Richards was appreciated by Matthew for his precise and quietly ambitious nature and his ability to handle larger projects. Accordingly, after being made partner in 1964, following his successful work as project architect on Matthew’s Arts Development in George Square, Richards was given responsibility for a number of large projects, usually large public complexes, including Stirling University and the Royal Commonwealth Pool. The Royal Commonwealth Pool is seen as one of Richards’ finest achievements and is outstanding in a variety of ways, some of which are the way in which its large size is fitted into the landscape, the good circulation and the way in which two perennial problems in the design of pools, glare and condensation, have been solved. Similarly the Pathfoot building at the University of Stirling, with its strong horizontal emphasis, is notable for its functionality and organisational clarity. As with the Commonwealth Pool, the building fits well into the landscape, the large footprint being broken by a series of visually manageable terraces and courtyards. As one of the younger post-war generation of designers, Richards was opposed to vernacular or folk approaches to architecture, tending more towards a slender, post-and lintel architecture of metal and glass. His use of the grid and ‘intense discipline of detailing’ gave his designs an overall harmony. Though his earlier buildings were ‘rat-trad’ (rationalised traditional), where technologies were traditional but components were largely manufactured off-site, he turned as much as possible to assembly of components off site, claiming that ‘in a scientific age’ architecture was ‘increasingly influenced by aesthetic and ethic preferences for precision and logic’. His two airports designs, Edinburgh and Aberdeen, are the best examples of his use of prefabricated construction. Richards was active in professional matters and served as President of the RIAS from 1983-84. He taught at the Mackintosh School of Architecture in Glasgow. He enjoyed the stimulation he received in the academic environment and saw it as a reward away from the increasing pressures of business. He was very aware of the relevance of professional and academic bodies, their mutual involvement and their relationship with practice. He was an elected Associate of the Royal Scottish Academy, a Commissioner of the Royal Fine Art Commission for Scotland, Chairman of the Architectural Design Research Committee, BRE, Member of the Agrément Board, Member of the Buildings Standards Advisory Committee, Member of the Williams Committee on Galleries and Museums in Scotland, Governor of Edinburgh College of Art and Chairman of the Housing Corporation Scottish Committee. Richards received honorary doctorates from Napier University and the University of Stirling. He was awarded the CBE. He died on 29 October 2003, survived by his wife Margaret Brown whom he had met when she also worked for the practice, and their children. 1975 Edinburgh Airport Edinburgh Scotland Project architect. c. 1960 University of Edinburgh, David Hume Tower (Arts Building) and redevelopment of George Square Edinburgh, Midlothian Scotland Richards succeeded Steedman as Matthew's chief assistant (and later project architect) for the project.